PadMan is an Indian Hindi language social comedy drama film. Directed by R. Balki and produced by Twinkle Khanna, Gauri Shinde, Prernaa Arora & Arjun N Kapoor under the banner of Mrs Funnybones Movies, Sony Pictures, KriArj Entertainment, Hope Productions & Cape of Good Films. The film features Akshay Kumar, Sonam Kapoor & Radhika Apte in lead role, Amitabh Bachchan also will appear in a cameo role. 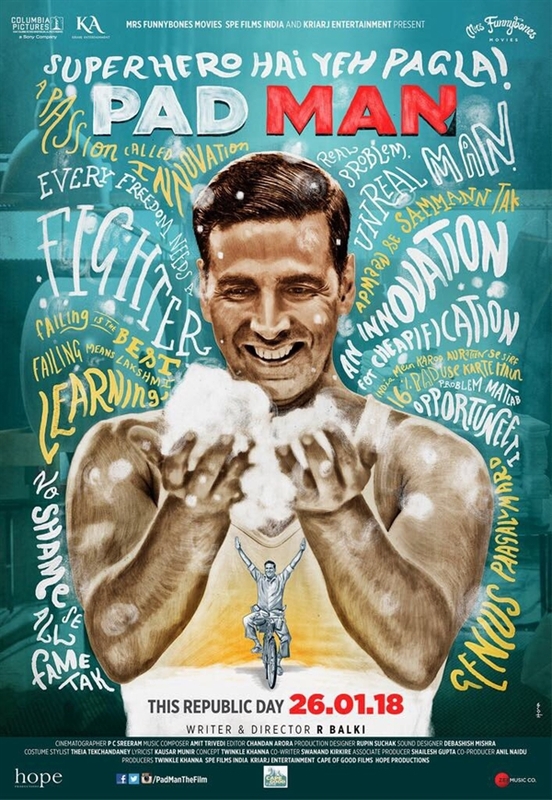 PadMan was released on 9 February, 2018 [India]. 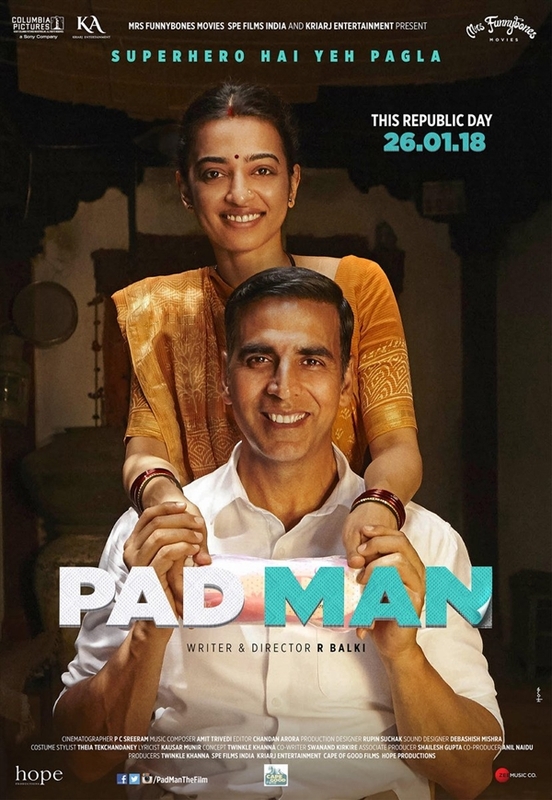 PadMan has been written and directed by R. Balki, who previously directed many Hit films like ‘Cheeni Kum‘, 'Paa' [ Paa received 14 nominations at the 16th Star Screen Awards and won five awards of those ] and others and it was scheduled to be released on 9 February, 2018. The film stars Akshay Kumar, Sonam Kapoor & Radhika Apte in key roles and Amitabh Bachchan will appear in a special role. Earlier, the film was supposed to be released on January 25, but it was pushed to February 9 to make way for Sanjay Leela Bhansali's Padmaavat, which was facing a lot of hurdles. PadMan is Twinkle Khanna's maiden production venture and will see Akshay Kumar play the lead role of Arunachalam. Akshay Kumar is known for giving content-driven films and he never fails to impress audience with his performance in his films and the way he sends out the message in the movie. Akshay Kumar’s last film Toilet Ek Prem Katha with Bhumi Pednekar turned out to be a super hit at the box office and now he is coming with a short story in Twinkle Khanna's book The Legend of Lakshmi Prasad and is inspired by the life of Arunachalam Muruganantham, a social activist from Tamil Nadu, Padman which also stars Sonam Kapoor & Radhika Apte. Subject of Akshay Kumar starrer Padman is off beat, so according to jackace the movie would have struggled to take an opening if Akshay Kumar was not the lead. it will depend on word of mouth and growth in big cities to head to a decent total. Padman needs solid growth on weekend and though it has two big holidays in Shivratri & Valentine's all really depends on the kind of word of mouth the movie. it has created tremendous pre-release buzz and it had already declared next hit hindi film by The trade experts as well as audiense. According to Jackace PadMan is expected to open average because of it's limited screens released in india. PadMan is expected to open 13-15 Crore range in india and if the film get positive word of mouth then the film will definitely cross 50 crores in it's opening weekend at the domestic box office. The music rights rights of the film has been acquired Zee Music Company. The music of the film has been composed by Amit Trivedi, while the lyrics have been penned by Kausar Munir. Its first song "Aaj Se Teri" was released on 20 December, 2017 which is sung by Arijit Singh. The whole soundtrack of the film was unveiled on 26 December, 2018 by Zee Music Company which consists 5 songs. Biography on Tamil Nadu activist Arunachalam Muruganantham, whose mission was to provide sanitary low-cost napkin's to poor women of rural areas. Who would use rag cloths or leaves during periods where use of sanitary napkins was rare. 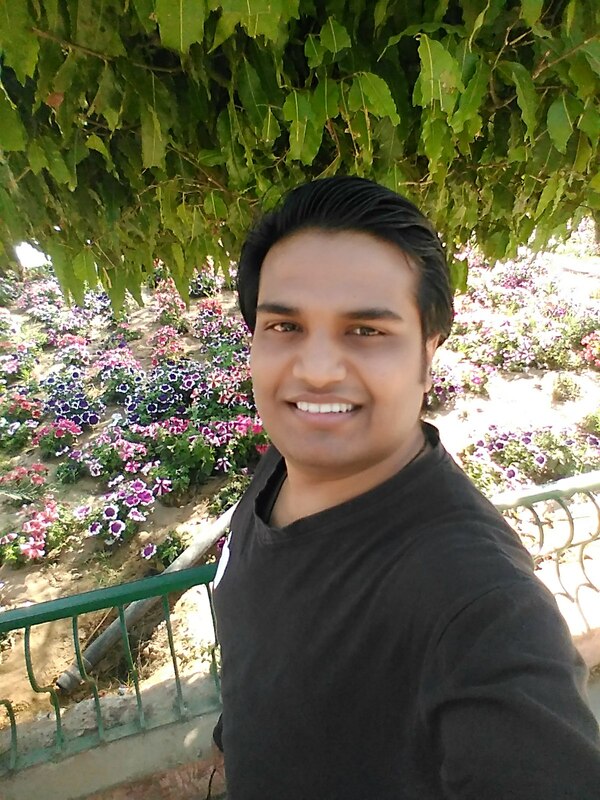 Upon realizing the extent to which women are affected by their menses, a man sets out to create a sanitary pad machine and to provide inexpensive sanitary pads to the women of rural India. No Comment to " PadMan: Box Office, Budget, Hit or Flop, Predictions, Posters, Cast, Release, Story, Wiki "